In My Own Words: Squash's Amanda Sobhy is on a mission to have as much fun as physically possible in a walking boot. And she's killing it. In My Own Words: Squash’s Amanda Sobhy is on a mission to have as much fun as physically possible in a walking boot. And she’s killing it. 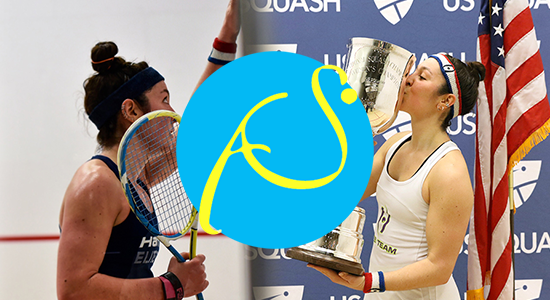 In this ongoing series, professional squash player Amanda Sobhy, who was ranked No. 7 in the world last year, shares her thoughts, struggles and triumphs as she recovers from Achilles surgery. I can’t believe 12 weeks have passed since I had surgery for a torn Achilles. When I first ruptured it (during a match in Columbia, nonetheless), I was so worried that all the time I need to have surgery, heal and recover would drag by. Nearly my entire life has been about training and playing squash, so what would I do without either? But now, I look back and wonder where all the time went. On April 19, I got my cast off and was put in a walking boot. Before I saw the doctor, I was so sure that I’d be able to walk in a boot without any problems. After all, I’d only not been walking for five weeks compared to all the years I’ve spent not only walking, but also running and playing squash competitively. How hard could it possibly be to walk on two legs again? Ah, my naivete is sometimes comical. I was SO off! I barely knew how to walk. First, though, let me explain the horror at seeing the pasty-white, flaky, atrophied and extremely hairy leg of mine that had been encapsulated in a cast for more than a month. Five weeks of not being able to shave my leg and I swear, you’d think I was a guy—it was that horrifying. Back to relearning how to walk: It was an extremely slow process. I still needed to use crutches at first to help support my steps, but either way, I was a human sloth. I was even slower walking in the boot than I had been when I was in a cast and had to crutch around on one leg. It was so mentally dejecting. I had just toughed out five weeks on crutches only to get my cast off and be even slower than before. I had had plans to celebrate a friend’s birthday in New York City a few days after getting into a boot, and suddenly the odds of that happening were not looking to be in my favor. But the more I walked on two feet again, relearning that muscle memory, the stronger I got. Slowly, I could move on my own, even if it took a massive effort. Two days after I got my cast off, I put aside my crutches and told myself I was going to leave Long Island, where I had been rehabbing since my surgery, and make the relatively short trek into New York City no matter what. Somehow, I managed to survive the city. Sure, it took me 20 minutes to walk two blocks to buy Levain Bakery Cookies, but I was able to experience my first speakeasy bar, bought a stuffed sloth at the Disney Store for my new persona and rode in a cab or uber everywhere I went. I finally felt like a normal person again, even if it was an exhausting few days. But it was amazing to see how much stronger I got every day in the boot. By the second week out of the cast, I was working out in the gym on two legs, doing exercises like battle ropes, medicine ball slams and TRX. In early May, I finally left my parents’ home on Long Island and headed back to my apartment in Boston to start physical therapy with Scott Waugh at Mass General Hospital’s sports physical therapy center. I was anxious to get back in my own place again and no longer have to live out of a suitcase, especially since I had still been paying rent on my apartment. My first few days of physical therapy consisted of applied heat, ultrasound and deep tissue massage to break up the scar tissue around my Achilles, followed by ice for 10 minutes. I also started doing basic mobility exercises like moving my foot from front to back and side to side, and single-leg lifts with ankle weights to strengthen my quad, hip joint and hip flexor in the leg where I had surgery. I did these exercises twice a day, every day, for the entire time I was in a boot. While my ankle felt stiff and almost frozen at first, it was satisfying to finally work on getting my mobility back rather than just having my foot locked up in a cast. The shift back to Boston was also a big mental boost: After five weeks with my parents, I was finally in my own apartment again, sleeping in my bed and back to some sort of “training” routine. I went to physical therapy every Monday, Wednesday and Friday morning. On Tuesday and Thursday, I worked out with my fitness coach, doing nearly every type of core and upper-body exercise imaginable, since my lower body was still out of commission. But every day I saw improvements in my mobility, and slowly I was able to point and flex my ankle a little farther and move it more easily from side to side. While such small improvements may not sound like much, recognizing that I was healing and headed in the right direction made me happy and excited. In May, I got cleared by my doctors to go to Barbados on what would have been an end-of-season holiday booked with another squash friend before I tore my Achilles. I still had to keep up with my daily exercises and wear the boot at all times, even while walking on sand, which turned out to be a real drag because it kept filling up with that sand. But the simple fact that I could go to a beach and sit there enjoying life with a cocktail in hand or float in the extremely calm and crystal blue water barefoot made me unbelievably content. If nothing else, the injury has given me a new appreciation for these type of little joys—and how much we can take for granted in life. After Barbados, I was excited to get back to therapy. At that point, I was able to start using resistance bands during my mobility exercises and, even more rewarding, I was finally able to do some form of cardiovascular exercise and ride a stationary bike for 10 minutes after two months of nothing. While that may not sound like much to some people, to me, it meant the world. It also made me extremely happy when Scott, my physical therapist, told me with genuine excitement that my ankle was looking great. Since then, I’ve been able to increase the resistance level and time I can bike, from 10 to 15 minutes, and I’ve started doing leg presses. There are days when I see people out running along the Charles River and wish I could do the same—I miss being able to run. I also see people playing brutal squash matches and miss being able to move around a court and play a competitive match. But I know I will come back stronger. After three months of recovery, the question I still get asked the most by family, friends and teammates is how I’m doing mentally. Obviously, I didn’t want to get injured, but it has given me new appreciation for my body, as well as a different perspective on my sport and training. I also haven’t had a long, uninterrupted break from squash in 10 years, and I’ve been trying to take advantage of the forced hiatus. When I was playing professionally on the tour, I would train two to three times per day and rest and recover between sessions. My life was entirely centered around training, traveling and competing. Now, it’s nice to be able to go out to dinner, enjoy a margarita or two (or three) and go to a music concert or sporting game without worrying about training or competing. So the answer is that common question is that my mental state is pretty positive. I may be a sloth right now, but I’m ready and willing to embrace and make the most of my slow-moving state.